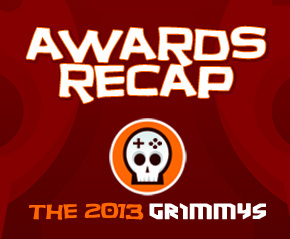 The 2013 Grimmys are complete. Did you catch all of that? Don’t worry, neither did Cole and Josh. Justin brings them in to get a fresh and final reaction to the winners and finalists of Horrible Night’s games of the year. 40 awards to sum up 2013. I know what you were thinking, we should have gone for an even 50. Haha, maybe not. Either way we had a blast coming up with the categories, nominations, remembering the highs and lows of our gaming in 2013, and we want to thank everyone who supported the livestreaming of our awards deliberations whether you were there live, downloaded the audio version after the fact, or shared your favorite award with a friend. Seriously though, a lot happened so we wanted to give you a more digestible version of the entire awards. Enjoy this recap with some final analysis of our award selections and links to all the awards in one place. Click the links below to see the deliberations video and the other finalists for each award. It’s not just about the awards, it’s about the journey/fighting over opinions. Once again we made our arguments public this year, in addition to sharing our individual games of the year lists just to make sure we gave props and slams to all that were deserving of them.